Not completely convinced the bruising was of central concern, an irritating wart that appeared to have caused a rash on his ankle seemed to be a more suitable reason to be seen by the doctor, so in keeping with his active lifestyle, Joe hopped on his bike and rode to the office to seek answers. As the doctor looked at the wart and rash, Joe didn’t even have a chance to mention the bruises before she stopped the exam and immediately ordered a blood test. The initial test and a re-test revealed a platelet count of 2,000 and the doctor asked that Joe not bike to the office anymore as she didn’t want him to risk getting injured. He would soon learn that the rash covering his entire foot had a name. It was called petechiae and this manifestation and the bruises were both symptoms of leukemia…and a rare autoimmune bleeding disorder called immune thrombocytopenia. Joe was quickly admitted to the hospital and administered a round of IVIG and went through other testing to confirm a diagnosis. As he sat in the hospital alone, he felt scared, anxious and was completely overwhelmed thinking about all the other things he had going on in school and with other activities and thought, “why is this happening now? Could this really be cancer?” It was only the year before that Joe had spent a couple of months in Europe. His parents met him for a twelve-day trip and they visited several countries. Joe was energetic, healthy and together they walked for miles. When he returned home, Joe worked tirelessly on a landscaping project with his Dad and felt fine…so how, in just one year’s time, could all of this become apparent so forcefully and quickly? Joe spent about seven hours in the hospital receiving the treatment. When he returned home, he slept soundly and awoke feeling energized and the best he had in quite some time, he called his Dad and told him how well-rested and much better he felt - until his body began rejecting the IVIG. Joe soon suffered from an excruciating headache, began vomiting, couldn’t see or open his eyes and his roommate drove him to the emergency room. Back home, Joe’s Dad, Dan had taken advantage of the beautiful day in late October and had just finished cleaning out the garage. He was about to jump in the shower and head out to dinner with Joe’s stepmom, Pat when the phone rang. It was Joe’s roommate letting him know how sick Joe was and that he was driving him to the E.R. “I threw some things in a bag and jumped in the car to make the three to four-hour drive from the Twin Cities to Fargo, North Dakota,” said Dan Winter. “I think it was the fastest we ever made that drive, but when we pulled into the hospital parking lot, it was a scary thing. There in front of us, was the Roger Maris Cancer Center…I didn’t realize that’s where Joe was,” he said. A round of steroids managed to get Joe back on track and curbed the reaction he had to IVIG. What followed were months of different treatments. In addition to IVIG, Joe tried rituximab, WinRho, and endured many months of prednisone and its toxic effects. He encountered the ups and downs, good and bad and many days felt as though he were Dr. Jekyll and Mr. Hyde. His platelet count hovered around 20,000 to 30,000 with the adverse effects of corticosteroids affecting his daily life. Even after his diagnosis and while managing life on prednisone, Joe continued to make Dean’s List and was offered a job six-months prior to graduation in 2015. He moved to Wisconsin and began his new job where he quickly became the top rookie salesperson, but ITP continued to take its toll. The destructive treatment effects and low counts left Joe feeling defeated and helpless and he began to feel that a splenectomy was becoming his best option to beat ITP. As a concerned parent and to learn more about ITP and treatment options, Dan Googled “ITP support” and found PDSA. In July of 2016, the Winters attended the Orlando ITP Conference feeling overwhelmed, frustrated and disheartened hoping to learn more about removing Joe’s spleen, but what transpired took the family down a very different path. They connected with other patients, families and world-renowned specialists and left with a toolkit of resources feeling knowledgeable, empowered, in control and ready to beat ITP…without removing Joe’s spleen. “Joe has learned so much more about ITP due to his association with PDSA and thus he is more knowledgeable about and in control of his health. 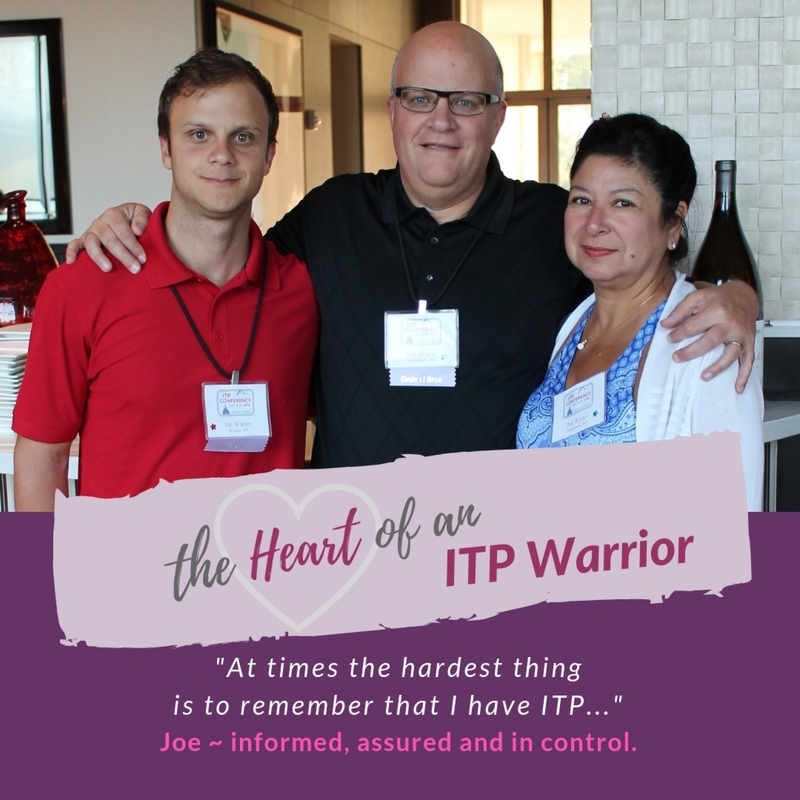 ITP is no longer the three mysterious letters that they were when Joe was diagnosed in 2014. PDSA has helped countless people like Joe over the years and has helped encourage medical advances without the benefit of any federal funding which is an amazing accomplishment!” commented Dan. “As parents, meeting other people at the conference made us aware that we’re not alone and learning the progress made in treatment options over the past five years is encouraging,” he said. “We met so many people that have been through so much. I don’t think I could do what they have,” commented Pat Winter. Today, Joe maintains platelet counts in the 40,000 – 50,000 range on Promacta®. It’s curbed the bruising, petechiae and diminished the fatigue with no side effects and has allowed Joe to find his new normal and live life. Joe works full-time, plays softball, bikes, is deeply involved in his local community and enjoys many activities with his girlfriend, Marguerite. He is the facilitator of the ITP support group in the Twin Cities area and volunteers as an ITP Conference Ambassador where he welcomes first-time attendees to the PDSA family and helps them navigate the program. “ITP has changed me by helping me learn that not everything in life is controllable. I am so lucky that with the help and support from my family and doctor that I am able to enjoy life. At times the hardest thing is to remember that I have ITP and to push the limit on having fun!” remarked Joe.